An American robin snatches suet from a backyard feeder. A robin nest with three eggs. The birds have figured in poetry, mythology for centuries. One of the most familiar and abundant birds on our continent and a universal symbol for the season of spring, the American robin ranges from the northern climes of Canada all the way to southern Mexico. Light and quick and in tune to the gathering length of day, it runs, hops and stops its way across lawns and grassy meadows, its famous red breast bobbing constantly for worms beneath the surface of a sea of green. Sentimentally named after the European robin — an Old World Flycatcher and biologically unrelated — the American species of robin belongs to the thrush family, specifically the songbirds called “Turdidae.” Like most songbirds, robins have a specialized dual voice box, the syrinx, which allows the bird to produce two notes at once, thereby increasing the ease of its repertoire. Often the first to sing at dawn and the last to quiet down at night, male robins are the music makers, offering a lighthearted melody composed of about 10 whistles in a row. Phonetically, its sound is most often described as, “cheerily, cheer up, cheer up, cheerily, cheer up.” They also employ a special call that can sound like a laugh or a quick chuckle. Male robins use their voices to proclaim territory, announce predators and, most importantly, attract a mate. Birds pair off for the breeding season with both partners contributing to nest building and the care of chicks, though the bulk of the domestic work falls to the female. One of the first breeds to nest in the spring, if conditions are right, a mother robin can bear two, sometimes three sets of young in a year, with each brood of two to four birds taking only one month to move from fertile eggs, to fledgling chicks, then back to empty nest. 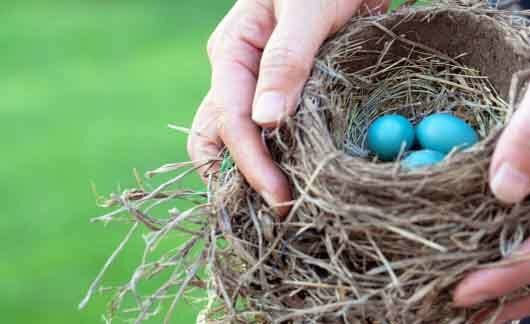 The signature color of the American robin’s egg — that unmistakable bright blue-green — is achieved when biliverdin, a bile pigment, is added to the shell in the final stage of egg production; the deeper the hue, the more likely the father will be to take an interest in his offspring. Since 1993, “robin egg blue” has been an official color of the Crayola crayon collection. Culturally, robins have figured prominently in poetry and mythology for hundreds of years, frequently portrayed as guardians (or thieves) of fire and light. An age-old icon of the vernal equinox, one medieval Celtic legend predicts that the person who sees the first spring robin will have good luck and prosperity throughout the year.